When we returned last week and visited Manyeding Primary School we could hardly see the PlayPump head because of the number of kids playing on it and others were running from their classrooms to join in the fun. Manyeding Primary Schools has 351 kids and 14 educators. 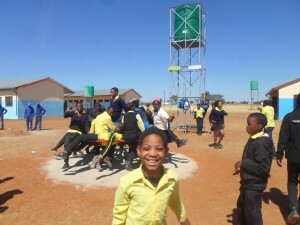 Before the PlayPump they had a windmill but this had been broken for a long time causing the school to struggle with their water requirements in the dry and dusty Northern Cape. 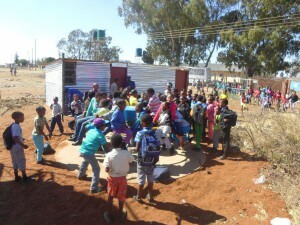 Gasebonwe Jantjie Intermediate School’s PlayPump is a popular meeting point and even the older learners are keen to spin on it. 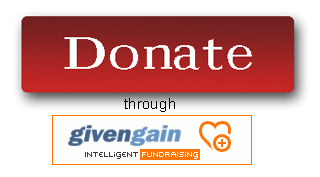 Previously the school had to rely on community water or draw the water from a stream. To ensure the midday meal was cooked with clean water the learners brought water from home. The principal also used to bring water from home in her car, but when that broke down the school was in trouble. With the PlayPump they now have reliable water. 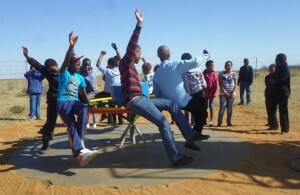 This month we have installed a further two PlayPumps in the Northern Cape thanks to a donation from HCI. At Bogosieng Lekwe Primary the 150 learners had to contend with a tap outside the school yard which was very unreliable and often there was no water. They previously had an electrical pump but could not afford to have it mended. Pupil bought water in bottles from home, but this was never enough for the whole day. A PlayPump will ensure water for drinking, cleaning hands and classrooms and cooking a daily meal. Reebone Intermediate School has also received a PlayPump. The electrical pump had been broken for over a year. They do have taps in the school grounds, but most of the time these supply no water, so the school has to rely on Municipal deliveries, but that is irregular and the water delivered is not enough to sustain the school or their vegetable garden. 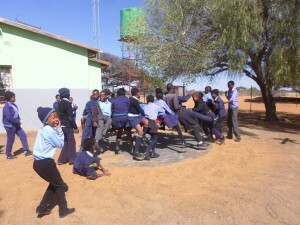 A PlayPump will certainly improve the situation at the school.